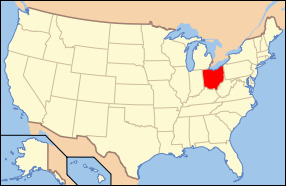 Ohio, whose name was derived from the Seneca word ohi:yo’, meaning "large creek"
Ohio is called 'The Buckeye State' because of all the Ohio Buckeye trees within the state. The tree is called the buckeye tree because its nuts resemble the shape and color of a deer's eye. The story of Ohio's statehood dates back to the Ordinance of 1787 and the creation of the Northwest Territory, a large body of unsettled land that encompassed what is now Ohio, Indiana, Illinois, Michigan, Wisconsin, and part of Minnesota. Seven U.S. presidents are from Ohio, another nickname for Ohio is "Mother of Presidents"